For the second time in the same week the Flippin’ Birds broke the school record, scoring a 196.725 and topping Utah State University who scored a 195.725. There was a lot to celebrate as the Thunderbirds were solid on every event, capping the night with a 49.475 on floor which is the second highest mark in school history. Freshman Autumn Jorgensen tied the school record on floor with a 9.950, fellow freshman Madison McBride tied for second all time on bars and the T-Birds set the school record once again. “I was real proud of them,” SUU head coach Scott Bauman said his freshman standouts. Jorgensen said to break the top mark in school history twice in one week is very surreal. 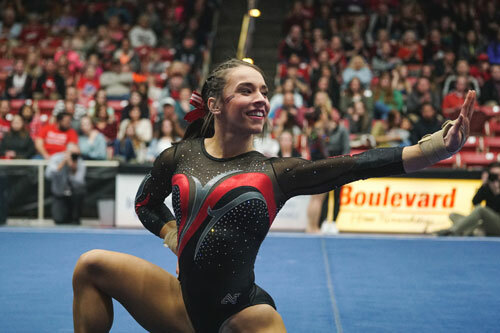 However, through all the success the Thunderbirds had on Friday night there was a somber close to the night as SUU senior Danielle Ramirez suffered an injury during her floor routine. Ramirez was an NCAA qualifier for the Thunderbirds last season and is one of the top all-arounders in school history. The full extent of the injury in unknown at this time. SUU started strong on vault where they were led by Madison McBride’s 9.850. Jorgensen and Ramirez both scored a 9.825 to help lead SUU to a 49.025 on the event. SUU stepped up big on bars, scoring the third highest score in school history on the event with a 49.250. Madison McBride led the T-Birds with a 9.925, securing the event championship and putting herself in a tie for second all time in SUU history. “I knew I had gone out there and done my best gymnastics, and that meant the world to me. It was just so cool,” McBride said about her score. On beam, the T-Birds were led by senior Tyly Bozzuto, who had a 9.825 , earning her the event champion on the night. SUU scored their lowest team score of the evening on beam with a 48.975. The Thunderbirds had the Centrum rocking when they went to floor, as Karen Gonzalez started things off with a personal best of 9.900. Stacie Webb scored a personal high 9.925 on the event and Jorgensen tied the school record with a 9.950. The Thunderbirds claimed the event championship on all four events Friday night. With the victory, the Thunderbirds move to 4-1 on the season, with their lone loss against Boise State. The Thunderbirds will continue their three-meet homestand next Friday as they will host the Cougars of Brigham Young University. That meet is scheduled to start at 7 p.m.